In October 1977, before the castaways were even rescued from Gilligan’s Island, NBC dipped its toe into the nostalgia pool with another feature-length revival of a 1960s television favorite: Halloween With The New Addams Family, an obscure special that has been dutifully uploaded to YouTube by Lee Pete, whose stash of pop culture treasures also includes the Wayne’s World VCR game and some vintage Cartoon Network bumpers. The 1977 Addams Family movie, despite that troubling word “new” in the title, has nothing to do with the late ’90s revival series. 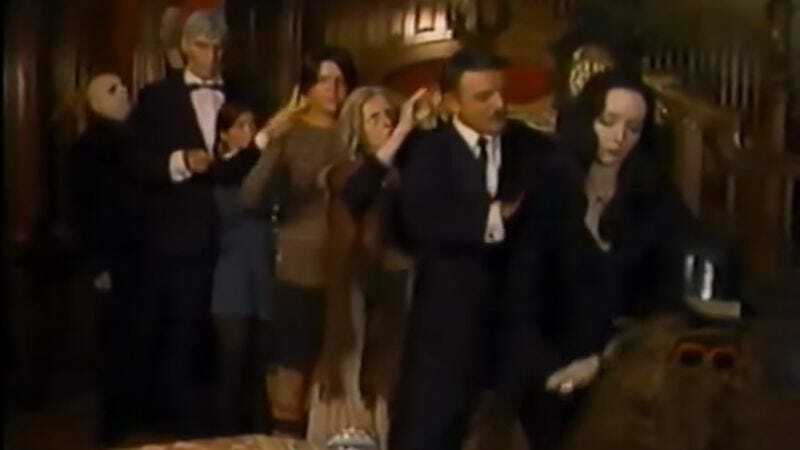 Instead, miraculously, it reunites virtually the entire cast of the original 1964-66 TV show: John Astin, Carolyn Jones, Jackie Coogan, Ted Cassidy, Lisa Loring, Ken Weatherwax, and even Felix Silla, who played Cousin Itt. Vic Mizzy, who memorably scored the ’60s show with harpsichords and finger snaps, has also returned. The only major person missing is Blossom Rock, a.k.a Grandmama. The actress died at the age of 82 just a few months after the special aired; her role is played instead by Jane Rose. The director, David Steinmetz, is a one-film wonder, but the script was written by sitcom veteran George Tibbles, who wrote a few episodes for The Addams Family’s longtime rival, The Munsters. At first, it is disconcerting to see the ghoulishly genteel Addams clan subjected to the indignities of the Jimmy Carter era, including grainy videotape (thanks, Norman Lear! ), chroma-keyed credits, and topical references to Star Wars. But, blessedly, Steinmetz and Tibbles have not tampered with the Addams Family formula too much. The plot largely revolves around the failed efforts of a gang of inept crooks (led by Parley Baer) to rob the still-impressive Addams homestead. Meanwhile, Gomez worries that his hot-blooded brother Pancho (Henry Darrow) might be putting the moves on Morticia. Also, Gomez and Morticia have two new kids, Pugsley, Jr. and Wednesday, Jr., even though the original Pugsley and Wednesday are still around. That’s a little weird. And all of this is an excuse for the cheerfully morbid humor and Popsicle-stick wordplay for which The Addams Family is justly beloved.